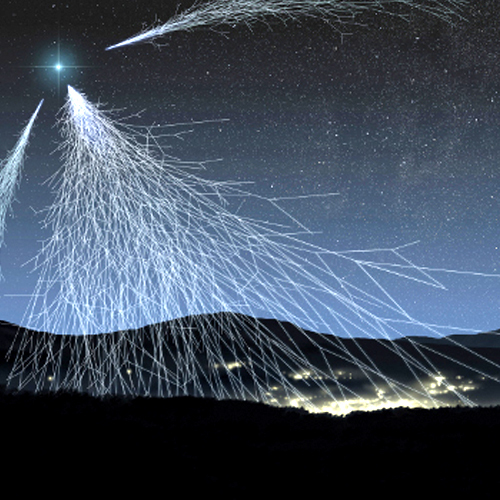 Something in the cosmos is sending out immensely energetic particles. Beyond that, our knowledge of the makeup, origin, purpose, and potential of these particles—cosmic rays—is incomplete at best. Although we know little about them currently, we do know that a better understanding of them could lead to deeper insights and knowledge of the rest of the universe. In a nutshell, cosmic rays are fast-moving particles from space that collide with our planet from all directions. These particles, most of which are protons or the nuclei of heavier atoms, travel at nearly the speed of light and therefore have very high energy. In fact, the highest energy cosmic rays have ten million times more energy than particles produced by any accelerator here on earth. We know that low-energy cosmic ray particles striking the earth come from our own Milky Way galaxy. They may originate from supernovas that mark the deaths of many stars. These blasts can generate enormous, fast-moving magnetic fields which in turn may accelerate charged particles; cosmic rays can gain energy when they interact with these intense, fluctuating magnetic fields. Sometimes particles can become trapped between two reflectors and bounce back and forth at high speeds, gaining ever more energy. This “magnetic shock acceleration” model was first proposed by Enrico Fermi to explain the acceleration of most cosmic rays. However, these shocks are not strong enough to explain the presence of the highest-energy cosmic rays. We’re still searching for the origins of these rays—which may lie outside the Milky Way. How can rays be detected? Observing cosmic rays directly is only possible above the earth’s atmosphere. And high-energy cosmic rays are so rare that it would be impossible to have a detector large enough to capture a significant number of these rays to study. The only way to feasibly observe cosmic rays at the earth’s surface is by capturing “air showers” that fall to earth. These showers are created when cosmic rays strike air molecules in the atmosphere and create secondary particles. These particles usually fall to earth over a large area, usually over many square kilometers. This explains why the Pierre Auger Observatory has a detector area that is roughly 30 times the size of Paris. Learn more about the detection of cosmic rays at Pierre Auger Observatory.